In 1939 General Francisco Franco, an ambitious Spanish military officer, became the absolute ruler of Spain. Franco took the title El Caudillo – the Leader – and he was ruthlessly so until his death more than 30 years later. In the decades that he ruled, Franco had 30,000 dissidents executed, imprisoned more than 25,000 political opponents, built concentration camps, suppressed his people, persecuted his challengers, created a vast secret police network to spy on citizens, and even controlled the names that parents could give their newborn children. El Caudillo replied, “Father, I have no enemies.” The priest asked, “Then you have made peace with them?” Franco reportedly answered, “No. I have no enemies because I killed them all.” The priest and the general, with that deathbed conversation, defined the two ways – the only two ways – that we can be rid of our enemies. We can destroy them, the way of the world; or we can forgive them, the way of Christ. We have a great deal of experience with the former, but what about the latter? Can we learn to practice the art of forgiveness? And certainly it is an art, not a science. Forgiveness is not clean, antiseptic, or linear. It is a tangled, bloody mess. It is a storm of emotion and confusion; a process of starting, stopping, circling, advancing, backtracking, building, collapsing, doing better, doing worse, wallowing, and recovering – all muddled together. Yet, forgiveness is necessary. It is the Christ-prescribed path for personal and corporate healing. Healing, yes, but forgiveness is not necessarily a means of returning life to an idyllic state. It is not a magic wand that puts everything marvelously back into place. No doubt, it can have incredible reconciling powers, but forgiveness doesn’t save every marriage. It doesn’t restore every family. It doesn’t repair every broken relationship. It won’t necessarily make you feel good about your son-in-law, your ex-wife, or your step-son who is bleeding you dry. And it is a guarantee that when you try to forgive or reconcile with some people, it will bounce off of them like a rock skipping across flat water. Consider Christ himself. With the central act of God’s loving grace, Christians believe that Jesus died on a cross and was resurrected from the dead, bringing life and forgiveness to all. But even the risen Jesus has scars. 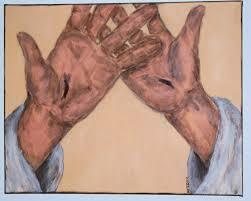 As he appeared to his disciples in the cross’s aftermath, he showed them his pierced hands and feet. The wounds were no longer fresh and flowing, but the marks were there. Jesus did what he did, deliberately. He chose to become this suffering symbol of all that had gone wrong with the world, the personification of the shameful way humanity spurns God’s embrace, harms each other, and injures creation. Further, those whom Christ loves, many of them, will never in their lifetimes respond to this love. They will never acknowledge it. They will never embrace it. They will never be changed by it. In fact, many become hostile toward his love, but Christ does not obliterate those who could be considered his enemies. He loves them still, and his scars prove as much, for his scars mark the conclusion of all required and necessary wounding. His scars are undying signs that the damage which humans inflict on one another can mercifully end. His scars can resolve all disputes and end all animosities, not by means of unending revenge, but with eternal forgiveness. May we who bear the name of Christ, also “bear on our bodies the scars that show we belong to Jesus” – the scars of forgiveness.